Planning a visit to the Museum? We provide some helpful hints. 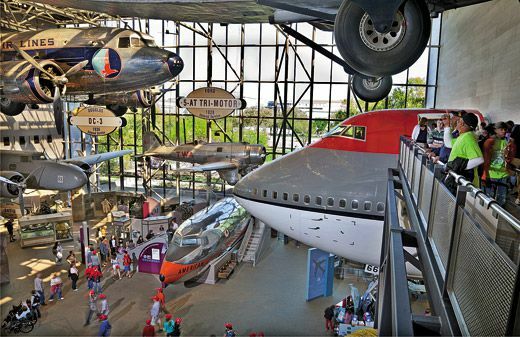 If you will be among the nearly three million visitors expected to be welcomed by the National Air and Space Museum this summer, here are a few hints to help you enjoy the experience. First, allow two days. You’ll need them to experience everything the Museum has to offer at its two locations: the National Mall building, which opened in 1976, and the Steven F. Udvar-Hazy Center in northern Virginia, which opened in 2003. On the Mall, you can see the 1903 Wright Flyer, which launched the aerial age; the Apollo 11 command module Columbia, home to Neil Armstrong, Buzz Aldrin, and Michael Collins during the July 1969 first lunar landing mission; and SpaceShipOne, the suborbital air-launched spaceplane that in 2004 completed the first manned private spaceflight. Beyond these and other major monuments of flight, less-well-known air- and spacecraft in the collection tell many stories of adventure and commerce. The America by Air gallery guides visitors through the history of the airline industry and into a Boeing 747 flight deck. Head up to the second floor to learn about Navy sea-air operations on the hangar deck bay of the fictional aircraft carrier USS Smithsonian, where you’ll see a Douglas SBD-6 Dauntless and other carrier aircraft. This summer, visitors will be treated to two temporary exhibits: “Fly Marines!” celebrates the centennial of Marine Corps aviation through artwork and artifacts, and “AirCraft: The Jet as Art” features lush, high-resolution images of airliners that photographer Jeffrey Milstein captured just moments before they landed. Interested in astronomy? Visit the Albert Einstein planetarium, or head outside to the Public Observatory and have a look at spots on the sun (using safe solar filters) or the phases of Venus. Like to test your own skills? Fly a combat sortie in an F-4 Phantom II, or ride on some of history’s greatest aircraft—from the Sopwith Camel to the F-5 Tiger—in the Museum’s flight simulators. Or view Earth from the open cargo bay of the space shuttle on a five-story-high IMAX screen. You’ll need an entire day to explore the Udvar-Hazy Center in Chantilly, Virginia. (If you’re staying in Washington, allow about an hour travel time by car.) The Center displays some of the collection’s largest objects, including the space shuttle Discovery, NASA’s longest-serving orbiter. From 1984 to 2011, Discovery flew 39 times, including 13 flights to the International Space Station, two to the Russian space station Mir, and three to service the Hubble Space Telescope. The aircraft are exhibited in groups, including aerobatic, commercial, military, and vertical flight. You’ll see the Lockheed SR-71 Blackbird, the world’s fastest jet. The one on display set a speed record of 2,124 mph in 1990 when it flew from Los Angeles to Washington, D.C., in 1 hour, 4 minutes, and 20 seconds. Speed isn’t just for military aircraft. The Udvar-Hazy Center is also home to the Concorde, the first supersonic airliner, which flew passengers at twice the speed of sound.